This year in our household: I'm the WINNER! Barely!! He saved $116.77 and I saved $118.41. And truth be told...he had most of his in change. But I was good at tucking dollar bills this year, so he gets to buy me, the winner, the ice-cream! So what did we splurge on? He found himself a great deal on golf clubs and got himself a never used set off Craigslist for $120. They are just what he needed to enjoy golfing with his Father and Son-in-Laws. Me? 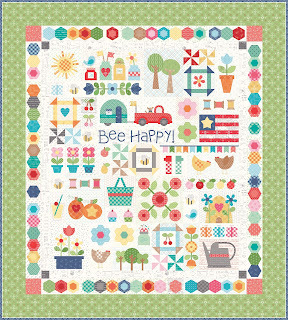 I couldn't resist joining Lori Holt's Bee Happy Sew Along coming up in August. 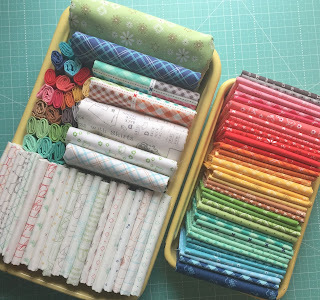 I'm soooo excited as I can't remember the last time I bought a yummy pack of fabric like this. Also, the code to our challenge button is on my sidebar. Please feel welcome to share it in your post or on your blog to invite your followers to join us here next Thursday, July 13th, as sign-ups for the 5th Annual Challenge will begin. I didn't sign up last year....but all the change that I saved because of your challenge-- in my 1/2 gallon jar, picked up from all of the cars, the ground, Jeff's belongings from work when I cleaned out his locker and tool box, random places throughout the house I ended up with over $210. I did sign up but late. I put my entire pink piggy bank (that my daughter made for me 30 years ago) on the collection plate at her church as a donation toward the short term mission trip I will be making with them in August. It was a challenge for the tellers to empty it without breaking the thing to extract a bit more than $250. The pig is back on the shelf above the dryer and has a couple of contributions already. Awesome! Isn't it amazing the amount we can save and the difference it can make a year later! Enjoy your mission trip...what a beautiful thing to do with your savings! I will count mine on the weekend. There won't be much after moving house/town and not having an income for 10 months I used every cent I have. There is a little bit there. I am also using my coins for coffee every morning before work. Can't remember if I registered or not, but will start counting my coins. I definitely don't have as much as the last time but every penny helps! You definitely made good use of your "savings"! What a great deal on the golf clubs. And your fabrics for the Fall Sew Along are gorgeous. Congratulations on some great savings! Oh yeah! You are going to have fun with the QAL. I love her work. 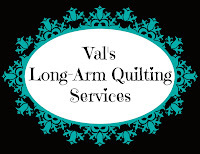 Val, I just learned of this challenge and would like to get the details so I can join in this year. Please explain the "rules." Thanks. Woo! You guys did great and I love your purchases! I cannot decide what I want to spend my savings on. I added my link and I will be joining you for the 5th! What an AWESOME challenge!! I visited all of the links. You were a wonderful inspiration! Very nice. Good for you and congrats.